Over the past few years there has been a concerted effort on the part of Refractive Surgeons and researchers to increase the number of people achieving 20/20 vision, attempt to get a significant number of these people to get 20/15 (significantly better than 20/20) vision, to decrease or eliminate night glare and halos, and to decrease or eliminate contrast sensitivity loss. This branch of work has been called Custom Ablation, or having a different ablation patterns dependent on the patient’s prescription and eyes. There have been several directions of research in the custom ablation area, but they have come down to two camps of thought. 1. Wavefront detection analyzers just aren’t sensitive enough to provide the information needed to properly image the cornea. 2. Wavefront measurement includes the whole eye rather than just the cornea. Therefore you would be correcting the aberration for the whole eye on the cornea. Those aberrations not on the cornea are not directly corrected, but indirectly compensated for which may not lead to the desired result. Furthermore, it has been shown that aberrations throughout an eye cancel each other out. By correcting one aberration, you may uncover another aberration that was cancelling it out. 3. There is an enormous amount of “chatter” giving inaccurate “garbage” information from the analyzers that do the wavefront measurements. Wavefront measurements are not done at the laser, they are done at a separate analyzing machine, and the data then transferred to the laser later on for the procedure. 4. It is dependent on the technical operation for a good reading, and the readings can be difficult to reproduce over multiple measurement. 5. Only a small percentage of the population has significant abnormalities , or what are called higher order aberrations. That would indicate that wavefront ablation is not useful for the other 90+%. 6. The measurement of aberration is for the ENTIRE EYE, and not just the cornea. Correcting whole eye aberrations on the cornea (the only place the excimer laser works) would actually throw off the light refracting system, and also perhaps expose other aberrations. 7. The excimer laser re-shaping itself can create NEW ABERRATIONS which cannot be accounted for. The wavefront guided school of thought has been championed by the VISX system, which received its FDA approval for wavefront guided ablation on the basis of the fact that it was as good as regular non-custom ablation, and nothing in the FDA approval of the Visx Wavefront Guided ablation system actually says that it gets better visual results than their regular system.. Other laser systems in the United States have virtually abandoned the idea of wavefront guided ablation as being effective. The second school of thought focuses on the actual shape of the laser re-shaping itself. This theorizes that the laser re-shaping of the cornea should leave behind a shape that is more similar to the natural cornea, or what is called a “prolate” shape. The natural human cornea is also not fully spherical, but is actually aspheric, which means that the dome of the cornea is steeper in the center than at the periphery. Corneal ablations that conform to creating this aspheric shape must also by definition create the more prolate shape in the center, and thereby a more naturally shaped cornea. When done properly this results in a virtual elimination of any added night/glare or halos from laser re-shaping, almost no change in contrast sensitivity, and also a significant jump in better than 20/20 results. In fact, the Alcon Wavelight Allegretto is the only laser FDA approved to prevent night glare and halos. This corneal re-shaping is also called Aspheric Ablation. Dr. Motwani was one of the earlier adopters of the aspheric ablation approach, and Dr. Motwani believes he was one of the first refractive surgeons in the United States to perform Aspheric Ablations in our Lasik San Diego Institute. This was originally done with the Nidek EC-5000, and for years the results from this laser system performing aspheric ablations were excellent. The Alcon Wavelight Allegretto Wave Eye-Q system takes the creation of Aspheric Ablations to another level, especially the faster 400 Hz system which Dr. Motwani uses. Not only does this laser create the a prolate, aspheric cornea, but combines that with an fast, accurate tracker and in the 400Hz a very fast ablation rate. Most laser re-shaping is done within 20 seconds, which is amazingly quick and aids not only accuracy, but also patient comfort. The Allegretto 400Hz also uses a Wavefront Optimized algorithm. As was mentioned earlier, most people don’t have significant Higher Order Aberrations, but just performing laser treatment on them may induce Higher Order Aberrations. The Wavefront Optimized laser treatment actually cancels out the aberrations that are created by the laser system itself for the type of correction and the type of cornea. 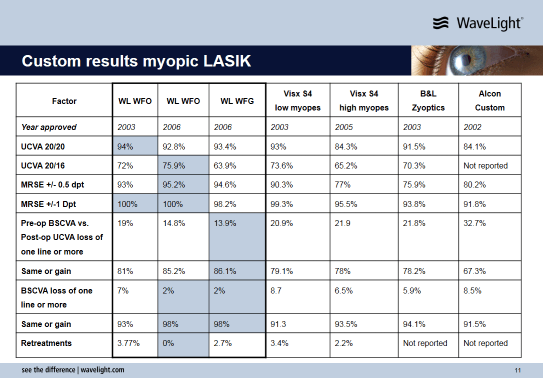 This has been shown to have some of the highest better than 20/20 rates for myopia and myopic astigmatism at about 76% of Allegretto study patients achieving 20/16 vision.